This future Veterinarian discovered her unique passion for animal science at the very young age of 9. Genna began caring for pets like her rabbit and very first dog and quickly realized her love for animals. As she graduated from smaller animals to larger pigs, sheep, goats, steer and horses, she developed a deeper curiosity for animal health and anatomy. As a freshman at California Polytechnic State University, San Luis Obispo, Genna works to further her education in animal science to accomplish the same aspirations she has had since she was 9 years old—to start her very own vet clinic. Genna’s clinic would be a family-run, wholesome operation dedicated to the well-being of any animal but would provide special attention to larger animals. The clinic would be mostly stationary but also have mobile capabilities that would allow her to travel to different ranches and barns to provide support to animals that aren’t so easily transportable. Genna’s father, Stacy Vieira works for Recology Sunset and has been a Teamsters member for 14 years. 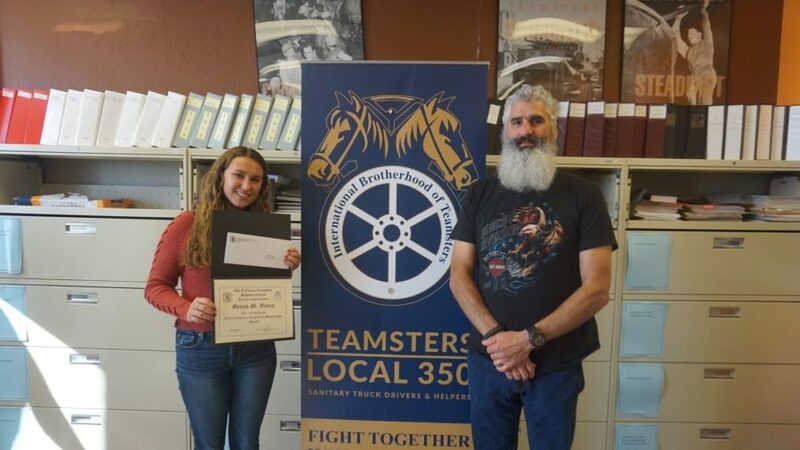 With best wishes and hopes in supporting her goals and aspirations, Teamsters Local 350 is proud to present Genna with the California Teamsters Hispanic Caucus Scholarship.